Hand hammered pierced gilded brass earrings from Herve van der Straeten. This designer is no longer producing jewelry, making all remaining pieces collectors items. 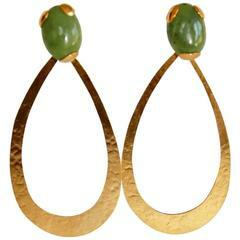 Herve van der Straeten drop loop pierced earrings with Jade top. 3" long. 9 connected rectangles come together to create each one of these fabulous statement earrings from Herve van der Straeten. A unique multi chain gilded brass bracelet from designer Herve van der Straeten. This designer is no longer producing jewelry, thus all remaining pieces are collector's items.